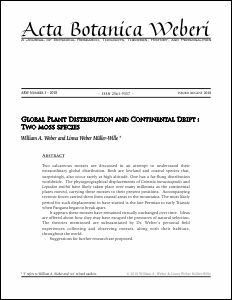 Abstract: Two calcareous mosses are discussed in an attempt to understand their extraordinary global distribution. Both are lowland and coastal species that, surprisingly, also occur rarely at high altitude. One has a far-flung distribution worldwide. The phytogeographical displacements of Grimmia incrassicapsulis and Leptodon smithii have likely taken place over many millennia as the continental plates moved, carrying these mosses to their present positions. Accompanying tectonic forces carried them from coastal areas to the mountains. The most likely period for such displacement to have started is the late Permian to early Triassic when Pangaea began to break apart. It appears these mosses have remained virtually unchanged over time. Ideas are offered about how they may have escaped the pressures of natural selection. The theories mentioned are substantiated by Dr. Weber’s personal field experiences collecting and observing mosses, along with their habitats, throughout the world. Suggestions for further research are proposed.